Curious to see how two different styles are able to blend? With the week almost coming to an end, we decided to change our regular signature ‘Lighting Stores on tour’, with lighting stores city by city around the world, to a fresh subject, just this week. Today you are here to enjoy a combination of DelightFULL style and products with Poliform SPA ambiances! The Poliform collection is set out as a wide diversified choice and includes systems and furnishing accessories for the whole house: bookcases, complements, wardrobes, beds, kitchens, sofas and armchairs. And this is where DelightFULL comes in with an amazing floor lamp that would perfectly fit their space style. It’s Miles Floor Lamp! Inspired by the American jazz trumpeter, bandleader, and composer: Miles Davis, DelightFULL has created a mid-century floor lamp that will bring back the sophistication and elegance of the ’50s. The black floor lamp has a vintage style that will provide a more welcoming and refined atmosphere to every single mid-century modern bedroom set or living room area. With a matte black finish and a structure 100% handmade in brass, the vintage floor lamp has a black ornament that provides a balanced design to the modern lighting. Poliform’s comprehensive product range carries with it the design idea of a ‘Poliform house’ with stylistically compatible component parts, a ‘global project’ for each architectural situation thanks to the exceptional versatility of its modular systems. Do you know what lamp could look on point in this minimalist/architectural/Scandinavian style they are going for? Ike Pendant Lamp! Poliform dedicates its creative and productive resources also to the parallel and complementary activity of large residential and commercial projects. For that reason, we think Amy table lamp is perfect here, for any project you need, this lighting design suits correctly! Amy vintage table lamp is a lighting design inspired by one of the greatest British singers and songwriters of all times. With a glossy black lampshade that resembles her iconic hair and a small brass detail that reminds us of her golden earring, DelightFULL was able to create an unforgettable reading light perfect for any music aficionado. This small brass lamp is perfect for a vintage bedroom, or a retro home office. Poliform has been heavily involved in realizations of the highest standard like London’s West End Quay and Café Royal, Amsterdam’s Conservatorium hotel and many other well-known places. But before we finish this article, we have one more suggestion for Poliform projects: Miles table lamp. Miles table lamp is a classic mid-century modern table lamp, which brings back the sophisticated atmosphere of the 50s. 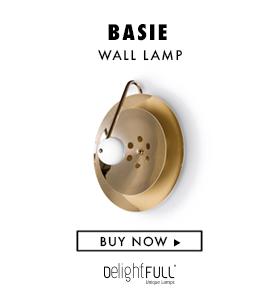 It is handmade in brass, with an aluminum shade. The body has a copper plated finish for a more contemporary look, while the shade is lacquered a matte black on the outside and a white matte on the inside. It looks stunning when put on display as an office lamp, so don’t be afraid to try and use it as a sophisticated study table lamp. You Can Also Read: WHY IS THE COLOR RED SO IMPORTANT THESE DAYS?